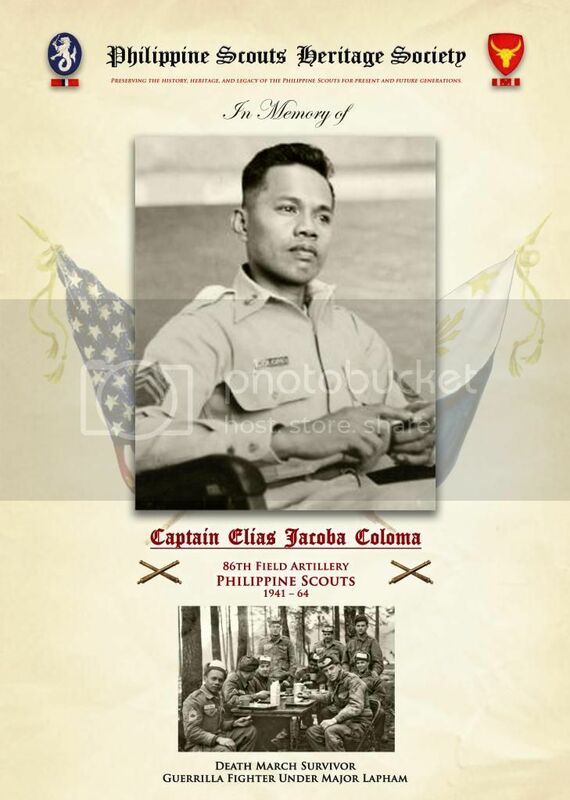 Elias Jacoba Coloma, born in Guimba, Nueva Ecija, Philippines, was the eldest of eight children born to Evaristo Lucas Coloma, Jr. and Juana Jacoba Coloma. Elias was found by the U.S. Army recruiter at the National Radio College in Manila, where he was taking a radio technician’s course. It was Spring of 1941 and there was not a war in the Philippines at the time. He was stationed at Fort Stotsenburg, and when the war started, assigned to the 24th Field Artillery Regiment, then transferred to the 86th Field Artillery Battalion as a radio operator. He was promptly promoted to Private First Class, 3rd Class Specialist, then Technician 4th Grade when the war started. Elias was naturally left handed, but the nuns wanted him to be right handed. Result? He was able to write clearly with both hands! In his early military career, he specialized in radio communications, was a survivor of the Bataan Death March, and a guerrilla fighter under Major Robert Latham. One afternoon his platoon was marching in a courtyard. Lydia Alcantra Asis was a beautiful nursing student watching the troops and told her friend, “He’s so good looking!” They were introduced through a cousin and after some serious wooing, they were married in June 1946. The growing family of five was stationed in Germany and was able to travel throughout Europe until they came across by ship and were stationed in North America, settling in Inglewood, California. Elias retired from the U.S. Army in 1964 with the rank of Captain. Elias had a zealous appetite for learning. He attended El Camino Jr. College and then went on to earn a degree in Engineering & Business from Cal State Long Beach. he retired from McDonnell Douglas after working on one of the first missiles that went into space. He then went on to retire from Hughes Aircraft. In 1973, he decided to put his business degree to work and started Island Products Distributing. The company imported baskets & handicrafts from the Philippines and Asia, selling at the Orange County Swap Meet and then wholesale across the country. Space B-100. The Basket Man. The Governor. “We got Donkeys, folks… We got Donkeys!” “Discount for Military! “Discount for Pregnant and Showing!” He reluctantly retired from the swap meet in the early 2000s, but would still keep in touch and sell to some of his best customers from the baskets stored in his garage. Elias is survived by his four daughters Arlene Coloma Smith, Pearl Coloma Garcia, Kele Coloma and Susan Coloma and his nephew, Freddie Damo. Also, his grandchildren and their spouses: Kevin Paul Smith, Karen Smith Chen & Alexander, Alina Sines Di Cesare & J.J. Karina Chantel Sines, Rhianna Garcia Kidwell & Christopher, Nathaniel Elias Mosley, as well as his great-grandsons Felix Chen, James Di Cesare III and Linus Chen. (Special thanks to Gil Mislang for providing us with this information).